Catch cowboys in action at fast-paced rodeos throughout Oklahoma. 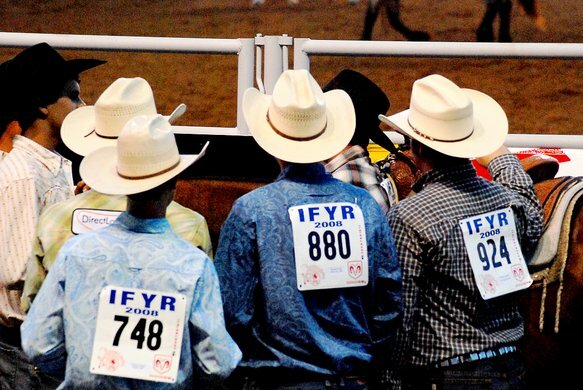 Experience the excitement of traditional rodeo and ranch activities including bull riding, steer wrestling, calf roping and bronco riding at officially sanctioned Professional Rodeo Cowboys Association and Professional Bull Riders Association events throughout the year. Even children get involved in the sport of rodeo at a young age riding and racing sheep during mutton busting events. Cheer on young competitors at the world’s largest amateur rodeo each summer, the International Round Up Club Cavalcade in Pawhuska, or attend the PBR Tulsa Invitational for hard-hitting bull riding action. Honor the Western icon himself at the annual PRCA Will Rogers Memorial Rodeo in Vinita or celebrate the long-standing sport and its traditions at the 101 Wild West Rodeo in Ponca City. Many other rodeos take place at Oklahoma City’s State Fair Park and at the famous Lazy E Arena in Guthrie, which is known for attracting some of the sport’s biggest superstars. Rodeos wouldn’t be complete without a little pageantry, and many crown their own royalty including the Freedom Rodeo & Old Cowhand Reunion. The “Biggest Open Rodeo in the West” even hosts an annual chuckwagon dinner. Come get in touch with your Western heritage at an Oklahoma rodeo to eat some delicious Western cuisine, see cowboys perform amazing feats and meet the newest rodeo queen. Feel the thrill at one of the many Oklahoma rodeos held across the state.